The City of San Francisco has proposed a new ban on sales in all non-FDA approved electronic cigarettes. The catch? No electronic cigarettes have been approved by the FDA. The FDA regulates new tobacco products before they are sold in stores, but electronic cigarettes have so far largely avoided this kind of monitoring by the Trump administration. Herrera held a press conference yesterday, during which he claimed that the Food and Drug Administration had "failed to do its job" since electronic cigarettes were deemed to be under the jurisdiction of the FDA in 2016. "These products are on the street while the required pre-market reviews have never been done," said city attorney Dennis Herrera at a news conference held yesterday. .
Public health officials have always been interested in protecting children from smoking, but as fewer children are starting to smoke and using nicotine substitutes, in recent years efforts have been made to prevent children to have access to the electronic cigarette. The last major survey conducted by the University of Michigan found that 21% of high school seniors were vaping in 2018, almost double the rate of the previous year. The San Francisco City District Attorney's Office, in collaboration with city supervisor Shamann Walton, presented the City's Supervisory Board with a bill banning the sale of electronic cigarettes until the FDA proceeds. to a thorough examination. 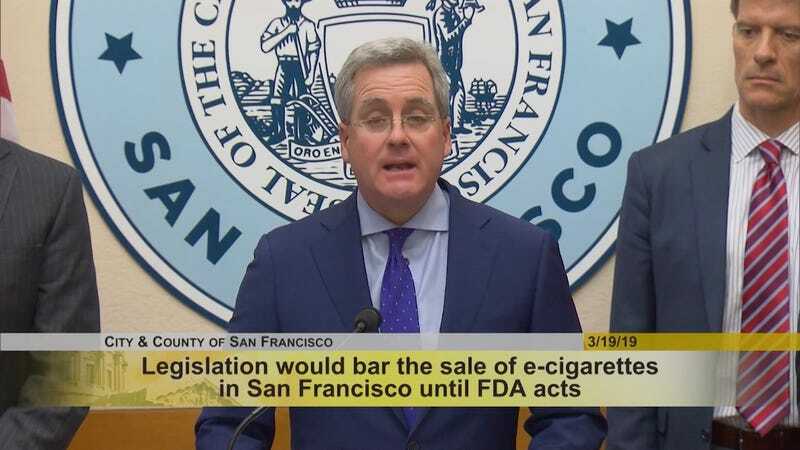 In addition, officials from San Francisco, Chicago, and New York sent a letter to the FDA yesterday asking the agency to speed up its review and hand over any documents that would allow these cities to make their own decisions about to the safety of electronic cigarettes. We share the concerns of the City of San Francisco regarding the use by youth of tobacco and steam products, including ours. That's why we have taken drastic action nationally, including putting an end to the sale of flavored products to retailers and supporting strong and restrictive regulation at the category level. to keep electronic cigarettes out of the reach of young people. But the main impact of this bill will be to limit adult smokers' access to products that could help them move away from combustible cigarettes. We encourage the City of San Francisco to severely restrict youth access, while preserving the opportunity to eliminate combustible cigarettes. This bill raises the question: Why would the city be comfortable with the fact that combustible cigarettes are on the shelves when we know that they kill more than 480,000 Americans a year? The US public health community is currently clashing with the idea that e-cigarettes are a good way to help people quit smoking traditional cigarettes. On the one hand, e-cigs are theoretically a "harm reduction" device better than smoking. On the other hand, electronic cigarette manufacturers want as many users as possible of their products. Herrera said at the press conference yesterday where he was on the issue. "These companies can hide behind the pretext of harm reduction, but let's be clear, their product is addiction," Herrera said. "They are becoming drug addicts or addicts." Other tobacco advocates point out that large tobacco companies have invested heavily in e-cigarettes in recent years as smoking rates decline and vaping gains popularity. Altria, the parent company formerly known as Philip Morris, made a $ 12.8 billion cash investment in Juul last December and now holds 35%. Curiously, while most members of the Trump regime have tried to dismantle regulations across the government, FDA's outgoing president, Scott Gottlieb, has been one of the few officials to report that He wanted more regulations in place to keep e-cigarettes out of the hands of children. Gottlieb met with representatives of Juul and Altria last week and was clearly disappointed with the discussions. "I wonder if flavored products should be sold in convenience stores, and I think the real debate is whether all these products should be sold in convenience stores, "Gottlieb told a panel at the Brookings Institution yesterday (coincidentally). Gottlieb even called it an "epidemic of Juul". "At some point, whether or not you think these products could help current adult smokers quit smoking, the use of youth is so widespread and widespread that no matter how valuable these tools might be. for public health, they may have I have not yet demonstrated that this is offset by use by young people, "Gottlieb said. Gottlieb announced his resignation a few weeks ago and his last day is April 5th. The White House has yet named anyone to replace him. San Francisco City Attorney Dennis Herrera clearly has a different view of the work done by Gottlieb and the FDA and feels it has not performed well enough. "The FDA simply has not managed to do its job in an unprecedented way," Herrera said. "These are prudent steps to make sure we know the health and safety implications of the products sold here." "If the FDA has not reviewed it, it should not be on the San Francisco store shelves."